Okay, simply put looking at the teams involved The Roughnecks are there! Which is AWESOME! The guide is translated in French here. Le guide est traduit en français ici. I hope they tune the rewards in terms of AP. Currently giving about 350AP on beta which is just stupidly low when there are also WQ that give 350AP. Predictable that higher difficulties reward different items, but I'd been hoping it would just increase the drop rates - also that we were guaranteed a reward on each victor, since there are so many options. Hopefully there's protection in place so you don't get the same account-wide reward more than once? Will these scenarios be added to LFD, or must we put our own groups together? Also, can you kick players for the group, and if so are they replaced or are the remaining players left to try and finish? Can anybody tell me where to actually start the introduction quests for Expeditions? thats lame..you can que at level 110 only after completing the intro quest..but don't get the intro quest on your first toon until 120..makes perfect sense. the fact you have to be in boralus to que for this kills the feature..sorry..not using it after the first attempt. just ridiculous to think peopel are gonna stand there at a misson table all day to que for this feature..very poorly designed. the island expedition maps also are fail. objectives basically have no markers and you are left to wander around aimlessly to find things for the bonus quests. i get that this is to support "exploration" which is the theme..but i imagine over time people are just going to feel that this, coupled with having to stand in the capital city all day long , basically ruins the feature. once mythic + dungeons launch..this will probably see 0 use. effectively, you made the same mistake you made in mists of pandaria with scenarios. It appears the progress bar on the island expedition table only shows up once you have reached level 120. Missing the most important info: where do you go and how do you start/queue up for an expedition. I have done a few of these and found nothing that holds my interest with these 3 man instances. At least the Pandaria scenarios had some level of play through. These are Diablo style smash and grab, but take too long to kill anything and reward little for the kill. It takes just long enough to be tedious and rewards nearly nothing making it feel pointless. Yes, there are some awesome looking pet rewards in particular but they are so incredibly dull it doesn't seem appealing enough to spend much time doing these. Yet, I retain Island Expeditions may be the most mindless and boring thing ever added to the game besides the mission table in WOD. Maybe someone can add a comment with how these are a better use of your time than say world quests. The location of Captain Rez'okun and the table for Island expeditions, is located at /way 44.56, 95.38 . As part of the Dazar'alor temple, on the map it is located at the most southwest corner, bottom level of the entire temple complex. Close to the Grand Bazaar, you'll spot it across from Captain Greenbelly and some stairs, in a covered area, attached to a ship. Any ideas why im getting only around 115 AP for some HC wins? Still seems semi buggy. Had the other faction NPC's just stop doing anything at 501 collected Azerite in one match, next we killed the entire other team but it still didnt't drop the tag from a 300 azerite value gold mob. The rewards for this seem really poor besides the cosmetic ones. People said it was good ap, but it really doesnt seem like it for time invested. Just when I thought things couldn't get any worse for the severely socially anxious after the road block forced raids, now we have Island expeditions to screw us all over too. Thanks Blizzard! I'm sure you all shot out of the womb bursting with confidence but sadly some of us are stuck permanently in our houses with Warcraft as our only source of light socialization (meaning we can be around people without actually having to talk/have people rely on us for anything), at least we did, until our gaming experience was ruined by major parts of the game being blocked by raids, dungeons, scenarios and now island expeditions. Very disappointing. I've been playing since 2004 and it's starting to look like the end for me. could at least have allowed us to que for a specific island..you know for those who don't wish to waste their time sitting on top of the mission table in boralus and oonly wish to do the 5 of these so they can get tier 3 ..just saying..very poorly designed..
nice "new" fish names by the way. very origional. also, any reason the hozen, jinyu and saurok have suddenly relocated from pandaria..or were you jsut bored. the artifact power awards are horrible. also, asides from the initial quest to unlock the feature at level 116, it is nothing more than a distraction from levelling as it forces you to sit in boralus and do nothing. just quest and que for dugneons. you will get way more artifact power that way, especially killing raes and looting chests along the way. suggest we all petition blizzard to make it so you can que through group finder, because the fact you can't is killing this feature. You cant win mythic expedutions atm. Not possible. What team setup would you recommend for Island Expeditions? 1 tank, 1 healer e 1 dps? Or 2 dps and 1 healer? I never cease to be amazed at the reasons for whining from entitled "adults." "Want to do Island Expeditions?" "Nah, I had stuff to turn in anyway so I'm there. I'll queue us." Oh, the horror. I don't know how we persisted through this feature killing atrocity. I'm level 118, have all three footholds, but never got any quest to start Island Expeditions? I share a battle.net with my sib so maybe they've already done the intro quests, but I now have no idea how to get access to island expeditions. A bit late to the party, but I just did 3 Normal IEs tonight with a friend. And dear god, Blizz..... I see this as something I'm going to GRIND out just for the damn reward. It was tedious, it was stressful, it was absolutely NO FUN whatsoever for me. I DESPISE "race" missions. Race against the time, race against an enemy...it's not fun for me. With dungeons, it's effectively the pace the tank feels comfortable with. Even if that's faster than I'm comfortable with while DPSing, it doesn't really affect me, because I just jump into the pack and start pummeling them down. This racing, I felt pushed to pull more, to pull things on my own, get that extra bit of Azerite. Also, bravo, Blizz, for making it table only, so we can't leave Boralus (more like Bore-alus now) while doing IEs. I may have missed it in the guide, but as the 3rd tier of the War Effort Advancement requires you to complete 5 different island expeditions. Is there a way to know which islands we've done, which ones we still need to do. How many different ones we've done I mean, as there isn't a requirement to do specific islands, just 5 different ones. I'm assuming this is character specific, doesn't make sense to be account wide. Some people are really ignorant. I mean, it's a valid question, why, except for just being a jerk, would anyone even bother to down vote it? It's a question. If you know the answer, maybe, just maybe you could answer it. If you don't, then WTF would you down vote it? So NO ONE could answer it? Ok, so I've done about 5 of these and they're really boring. I just don't see the point. And the reward isn't even worth the time investment. Aren't these supposed to be role-agnostic...? How come there's mention of Tank, DPS & Healer...? getting real sick of doing these on mythic and getting nothing but useless Doubloon coins to buy the even more useless minor buffs that don't even persist thru death. This guide is off. 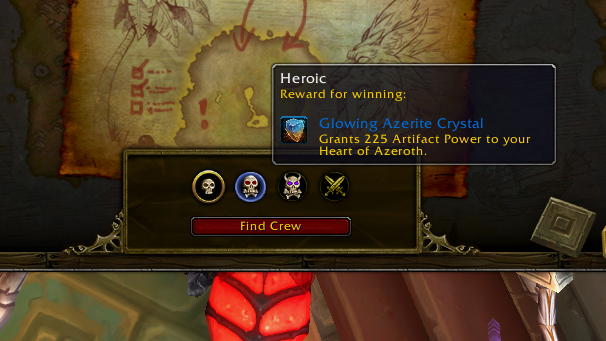 I had 3 pieces of azerite gear, one foothold open, and started island expeditions, before doing any quest and at level 112. I just did my first Island Expedition today. On Normal. I did not see any option to do it solo. So, how does one try solo? I'll admit the mob was difficult with 3, but I presume the AI would scale some features for solo play, as it does in other gameplay. I went through a portal today to "Unknown Crypt" that was empty. Can anyone tell me what this is about? People seem to find it funny to kick you just before the win. Happen to anyone else yet? This might be old news at this point but some might find it useful. Unlocking island expeditions seems to be account wide and after unlocking them any alts can queue for the lowest difficulty even while leveling. The recent buff to the xp gained and addition of the weekly wq for ap make doing expeditions while leveling a decent way to get a head start on ap, and some extra xp for those that are tired of questing or don't have the time to do dungeons. This whole expansion reeks of Blizzard half-assing a lot of stuff that should've been addressed in Beta. Hey BLIZZARD if you are reading this how about increasing the cap for COMMUNITIES. At the moment my Island Expedition Community is capped at 1,000. Why in the world would you cap a cross server feature? Guide says for regular or heroic you "May queue as 1-3 player party". Can someone tell me how to queue as a 1 player party? There are three island per week (or so) and you do not choose which one to do (small problem). The random other two players might want to do this as fast as possible and thereby not getting to stage three and the named rares, like Barnaby. Then there is the ordinary RNG on the loot table. And since some of the stuff you want are BOP it is no use to buy anything from AH, because you want the BOP stuff. The difficulty level has no influence on the drop rate. It does not matter if you win or loose. Never run toward the "action" - only walk. Never use anything other then auto attack. If it where possible, simply join an IE and do absolutely nothing, read a book, or watch something on TV. I wonder if there are premade groups that actually does this? In short it is boring and counterproductive. Let´s see if 8.1 does something to change this. Last night I have already tried it....It was unsuspicious ) Really! And your explanation is the best! The guide hasn't been updated with the new rules for 8.1 loot. It still says that it's dependent on what mobs you kill. you will no longer receive end of expedition rewards based on what you've killed. Is it because "special rewards" aren't rewarded at the end? Does the rewards for mobs in invasion events require the invasion event to trigger before you win? or does it always trigger before you win? Can the mounts tied to specific mobs which are in turn tied to specific islands also randomly from the invasion events? Considering Blizzard's attitude, it sounds like my most efficient route for getting what I want is just waiting until they've almost finished the expansion and they let you buy the items you want with some currency like doubloons. I want choice and progress instead of just pure RNG. Can someone please tell me exactly how to queue for soloing the Island Expeditions? The guide says it is possible to solo these on "Normal," but there's no explanation as to how to sign up for soloing. I've gone to the map, chosen "Normal," and then clicked "Find Crew" (which is the only option on the map)...and then I'm told I've been queued for a group. Consequently, I declined, because I don't want to group. "Normal difficulty is available to solo or group queue"
The key word in this statement is queue. It is unfortunately not possible to actually "solo" an Island Expedition. It simply means that individuals can sign up for a mission instead of needing to be in a group.